At Gascoigne Primary School, we use ‘Projects on a Page’ to facilitate teachers planning in Design Technology. Evaluating current products and thinking about how they want to produce their own product. Designing purposeful products for themselves, based on particular criteria. Generating ideas through talking and drawing. Selecting from a range of tools, equipment and materials. Building structures, thinking about how they can be made stronger and more stable. Exploring mechanisms (levers, sliders, wheels). Evaluating their finished product against the design criteria. 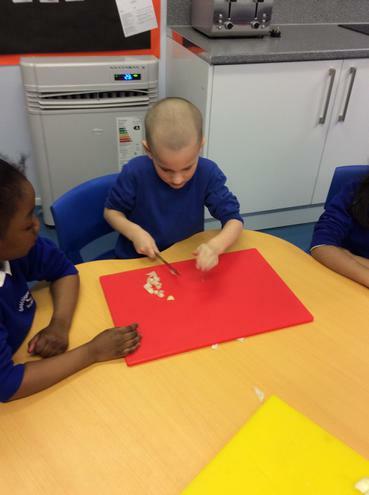 Year 1 pupils design a fruit salad to encourage children to eat more fruit. Their design is based on fruit properties, appearance, taste, smell and texture. Year 1 and 2 pupils use multimedia software to create a presentation to tell younger children about the people who help them get to school. Working in teams, they are each given a specific responsibility in creating the presentation. 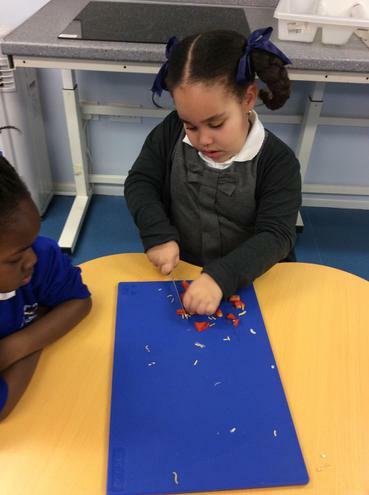 Year 2 pupils investigate how simple mechanisms can make moving pictures for use in storytelling activities. They then have a go at making their own simple levers and sliders. Using a doll for a model, year 2 children design and make their own Joseph Coat of Many Colours. They explore single and repeat patterns on a variety of fabrics, and use computer-generated as well as paper patterns. Your child can practise design skills by, for example, cutting out pictures from old magazines or cards, and folding and manipulating the paper to make moving pictures. Or they could use dough or plasticine to model their ideas. Create a ‘design box'. Recycle things like empty egg boxes, pipe cleaners, lolly-pop sticks, elastic bands, cotton reels, bits of card and plastic. Include masking tape, a hole punch and scissors. Your child can use these to create anything - miniature playground frames and swings, houses, furniture, or even alien beings. Ask your child to look for examples of levers and sliders at home. Investigate how doors hang, flaps swing, drawers slide, buttons press and locks click. Encourage your child to be more aware of how things have been designed around the home for specific purposes and people. Ask your child how he or she might go about creating a fruit or vegetable salad or smoothie that is designed to look and taste great. Talk about the type of ‘treatment' different fruit and vegetables require before they can be eaten, such as washing, cooking and peeling. Evaluate a range of existing products. Design a functional product according to a particular criteria. Discuss ideas and develop annotated sketches, cross-sectional and exploded diagrams, prototypes and computer-aided designs. Select from tools and equipment to produce products. Understand how to strengthen, stiffen and reinforce structures. Understand and use mechanical systems in their products, for example gears, pulleys, cams, levers and linkages. Understand and use electrical systems in their products, for example, series circuits incorporating switches, bulbs, buzzers and motors. A year 3 class developed their making skills by thinking about and combining ingredients according to taste, appearance and texture to create a healthy sandwich. A teacher divided his year 4 class into groups and asked each to select a piece of cardboard packaging for a tube of toothpaste. They looked at its construction, purpose and graphics and then recorded the information. After taking pictures using a digital camera, each group created a net (pattern) for their own design using computer-aided design (CAD) software. A year 5 class met a local toy maker who came armed with a range of old and new mechanical toys, which intrigued the pupils and got them thinking about how things move. This first-hand experience of working with mechanisms got them inspired to try a few experiments of their own. A year 6 class created their own house slippers for different purposes and people. They thought about how to address a range of needs, such as appearance, safety, warmth and size. They learnt how to make accurate patterns and templates and how to produce detailed working drawings. They practised their making and finishing skills to enhance the quality of their slippers. Finally, they evaluated their products critically against design criteria the teacher had given them, and identified what to do to improve them. Talk to your child about the role of design in everyday things at home. Make a list together including furniture, décor, clothes, food, cards and presents. They may be surprised just how much there is. Fill an old cardboard box with materials your child could use for making things. Recycle things, such as packets, plastic containers, small boxes, little bits of wood, rubber bands, old cotton reels, pieces of fabric, paper clips, string, paper plates, plastic cups, straws, toilet rolls etc. Remember to include design essentials, such as glue, sticking tape, a hole punch, a stapler and scissors. Give your child a project and encourage them to approach it like a real designer. This will help a lot with the way lessons are taught at school. Choose something that interests your child - cooking a simple dish, making clothes for a doll, designing a model car or plane, or creating a birthday card for a friend. 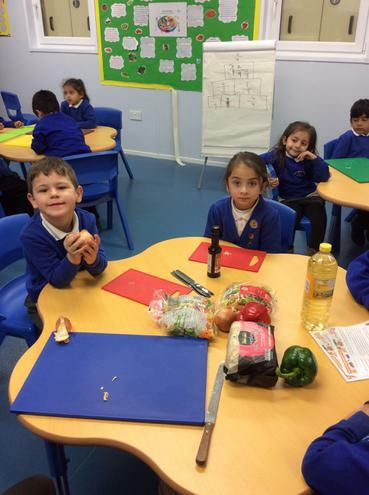 At Gascoigne, we believe it is extremely valuable and important to teach children about where food comes from and how to eat a healthy, well, balanced diet. 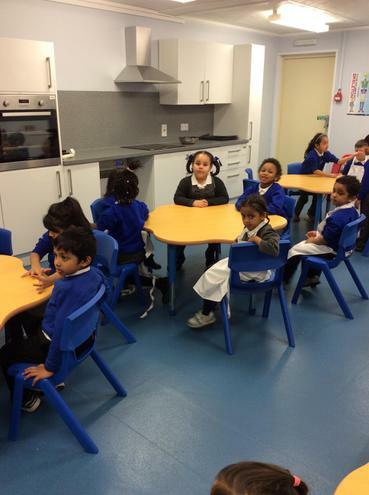 In order to promote cooking and nutrition further, we are fortunate enough to have two brand new Food Technology rooms! In the foreseeable future, we will be holding parental workshops and various after school cookery clubs, so watch the space! Cooking and nutrition falls within the design and technology curriculum. 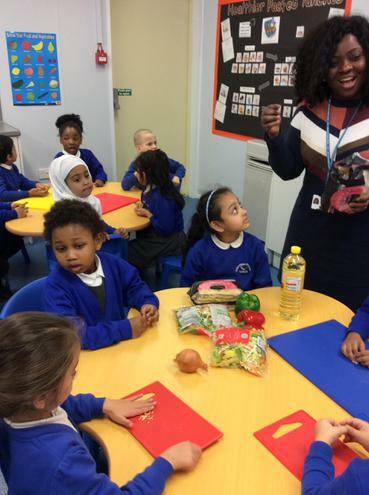 The new curriculum aims to teach children how to cook, with an emphasis on savoury dishes, and how to apply the principles of healthy eating and good nutrition. 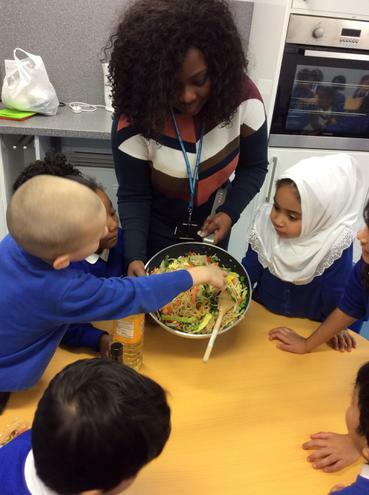 It recognises that cooking is an important life skill that will help children to feed themselves and others healthy and affordable food, now and in the future, potentially halting – and even reversing – the growth of diet-related illnesses. Alfreda "I liked the part the first time we made the pizza faces my whole family enjoyed it." Johnatan "I liked best the tuna and pasta because my nan liked it and I liked it as well." 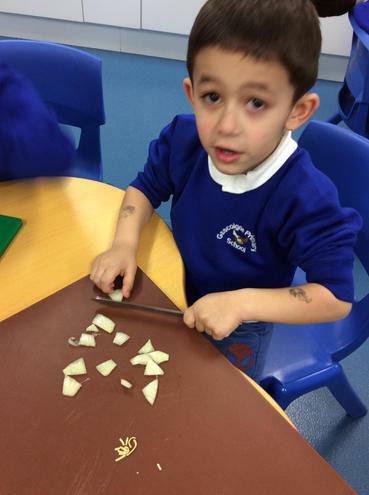 Harrihar "I liked when we were making and cutting the fruit, I really liked when we finished it off it was really yummy and tasty." Mohammed "I liked the first day of the cooking club and we made faces with tuna and cheese and I really enjoyed when I had it at home." 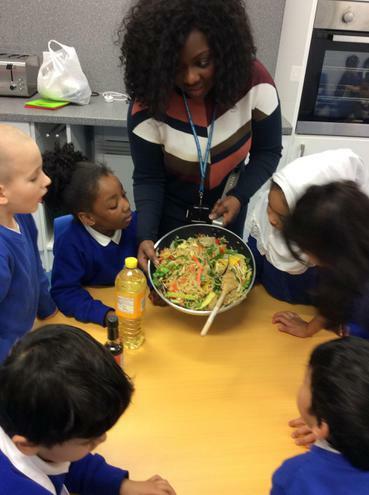 Kayinsola "I liked cookery club because I now know how to cook healthy and how to eat healthy and we had so much fun in cookery club." Lilly "I like cookery club because we had so much fun and we make stuff and take it home and I like the smoothie best!" 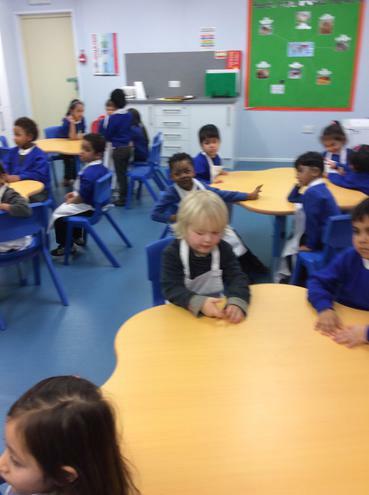 Alex "I like cookery club cause we make good stuff and its all good food and all the time we make nice food and my friends they could be coming here and enjoy the same thing as me!" Manushri "Healthy food can taste like normal foods and even better. 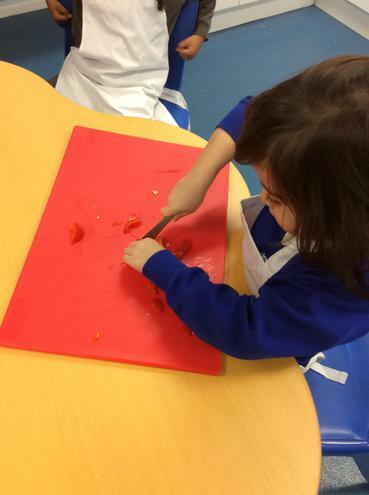 My best part of the cookery club was when I made the smoothie and did some exercise outside." Ismael "We do healthy stuff for our bodies and we also made a lot of healthy food with our friends, my favourite part was when we made the sandwich."